R.J. Reynolds is still one of the largest tobacco companies around, but as early as the late 1800s the company was already a major player in the tobacco industry. The company was founded in 1875 when R.J. Reynolds himself moved to Winston-Salem, N.C. and opened a factory to produce chewing tobacco. 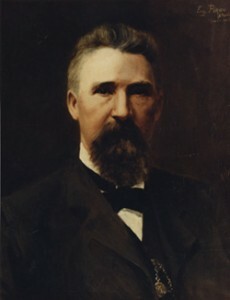 Reynolds used new technologies like steam power and machinery to grow his business and buy up other competitors. 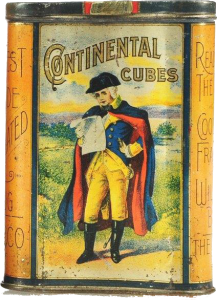 In 1907 Reynolds introduced the Prince Albert brand of tobacco using the image of Prince Albert (Edward VII) of England. 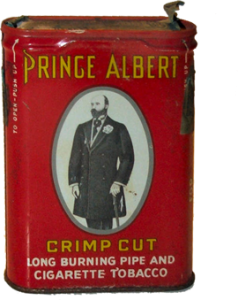 The Prince Albert brand was very popular and is still sold today for pipe smoking. Tins from the Prince Albert brand are exceptionally common and nearly any version of a Prince Albert tin will be worth around $5-10. 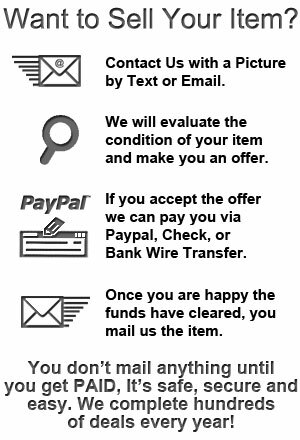 These can be found commonly on eBay at virtually any time. 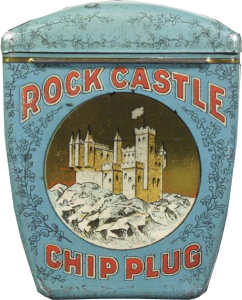 The one exception is the “Now King” tin which was made for only a year or two before the King died in 1910 and can be quite valuable and is very rare. 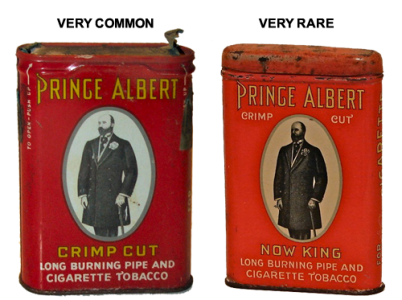 The company heavily advertised the Prince Albert brand and it is probably the most common tin seen in the market. Following on the success of the Prince Albert brand, in 1913 Reynolds ventured into the pre-rolled and pre-packed cigarette market, which at the time was not thought to be widely profitable as most people rolled their own cigarettes. The first brand launched would be called Camel cigarettes because they used a turkish tobacco with a milder flavor than some of the harsher smoking tobaccos. Everyone knows the success of the Camel brand but their packaging has always been focused on soft-pack cardboard packs instead of the tin cans used to package Prince Albert. The company used very successful advertising and promotional campaigns well into the 1990s before legislation outlawed such tactics. It also diversified its business away from a central focus on only tobacco as it became less profitable, and bought Nabisco among other firms. 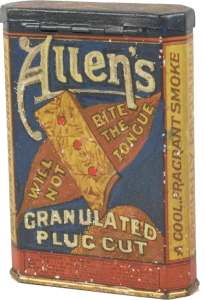 Tobacco tins carry all kinds of terms like plug-cut, cube-cut, cross-cut, roll-cut, crimp-cut, rubbed, and more. What do all of these terms mean and why would you advertise them? Prior to World War I, almost all tobacco consumed in America came as precut leaf that could be chewed or smoked by pipe or self-rolled cigarettes, while rolled cigars were popular in their own right and so each person had a preferred method or type of tobacco because things were not as standardized as you would see in a store today. Crimp Tobacco – Crimped tobacco is used primarily in pipe smoking and is made by lightly pressing short cut varieties of tobacco. 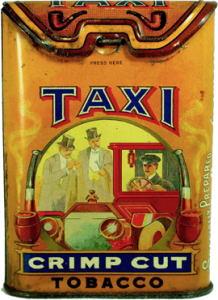 The Prince Albert tin below is very common and usually sells for around $5, the Taxi tin is one of the rarest tins around and easily sells for over $1000! Cube Tobacco – This is tobacco leaf that has been cut into small, relatively uniform squares that are easily put into a pipe or cigarette for smoking. Flake Tobacco – Flake cut tobacco is made by pressing tobacco leaves into long flat blocks and then slicing them. Flake usually is used to blend different tobaccos together and allow their flavors and moisture to merge to create a more uniform mixture. 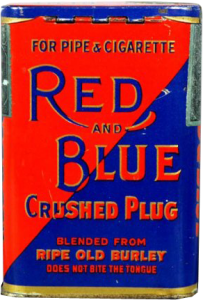 Plug Tobacco ( aka Navy Plug ) – Is made by taking tobacco and flavorings or additives and pressing them into a long roll which is then sliced into thin rounds. 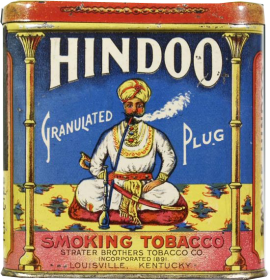 Plug is probably the most commonly seen type of tobacco on tobacco tins, however you can’t smoke the rounds directly and there are many sub-types of plug based on how the rounds are cut or shredded. Granulated Plug – The plug is ground into a small enough grain to allow smoking without the buyer of the tobacco having to rub out the plug themselves. These are not all the types of tobacco you might see mentioned on tins but I hope it gives you a good enough idea what the terms are describing to understand things even that might not have been explained here. 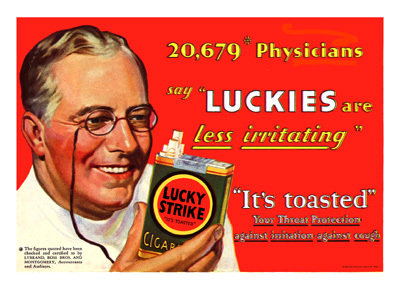 As cigarettes grew to an ever larger market share the type of tobacco used in the mixture and “toasting” and other curing methods would become more important advertising features and you can see this in the development of Lucky Strike’s branding in the previous post, especially if you go look at some of the antique magazine ads. Thanks for looking, see you again soon. 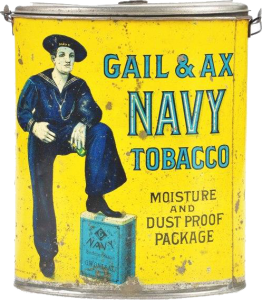 As a follow up to my previous post about American Tobacco Company, I thought I’d do a post today on their most famous brand and the tins that are out there. Lucky Strike is a brand made famous through advertising, but it has a long history and precedes the cigarettes we know it as now. 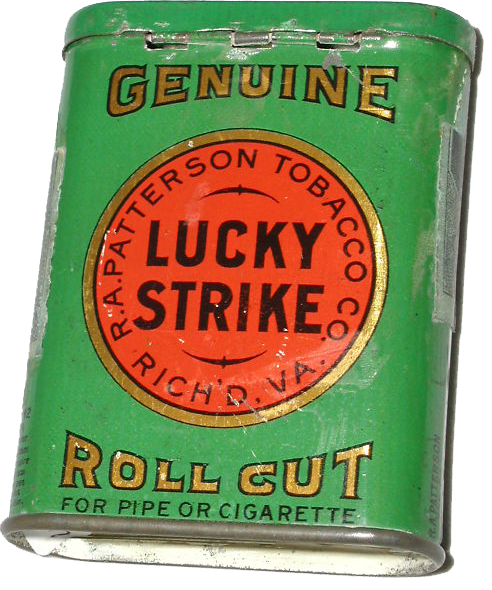 In 1871 the Lucky Strike brand was started as a chewing tobacco for the Patterson Tobacco Co. which was bought by American Tobacco and James Duke in 1905. Under American Tobacco the Lucky Strike brand was reworked as a cigarette brand in 1916 to compete with Camels which were becoming popular and were owned by R.J. Reynolds. 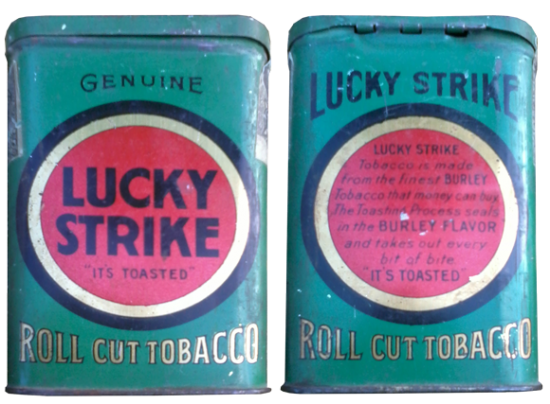 Lucky Strike Vertical Tin – This tin dates to the 1920s and is distinguished by the tagline “It’s toasted” and reworking of the logo from the previous one used by Patterson, seen below. 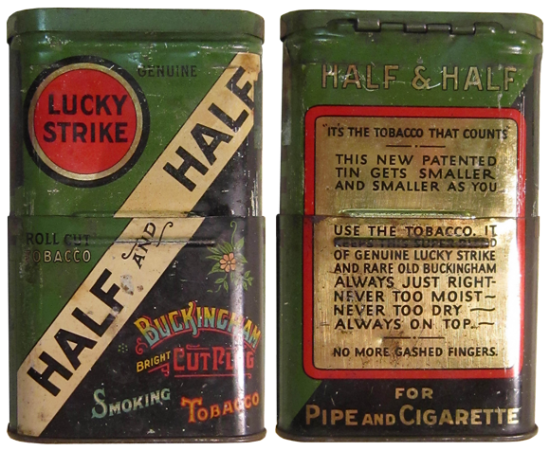 Lucky Strike Vertical Tin – This tin predates the 1920s redesign and while it still prominently features the R.A. Patterson name, the company by this point had already been purchased by American Tobacco Company. Half and Half Vertical Telescoping Tin – This is a really interesting tin that can shrink as you use the tobacco out of it so that your fingers can reach the tobacco at the bottom when you’re done. For a better idea about the telescoping tin look here, here, and here. Ads for the Half and Half mixture and telescoping tin can be found in newspapers from 1936, I do not know if they predate the ads by any time. 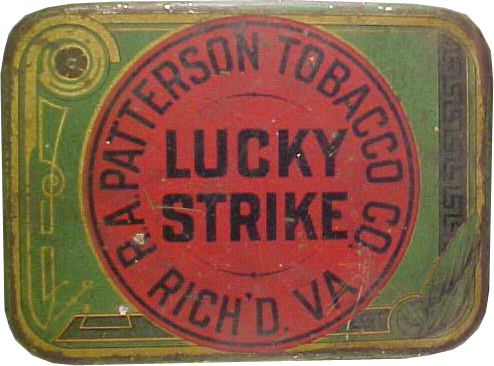 Lucky Strike Flat Tin – This tin features the Patterson logo dating it to before the modernized logo used after 1920 or so. 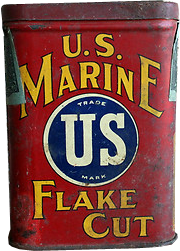 There is another flat tin with the older logo that is slightly different in proportion and has a zigzag border around the design seen on this tin. 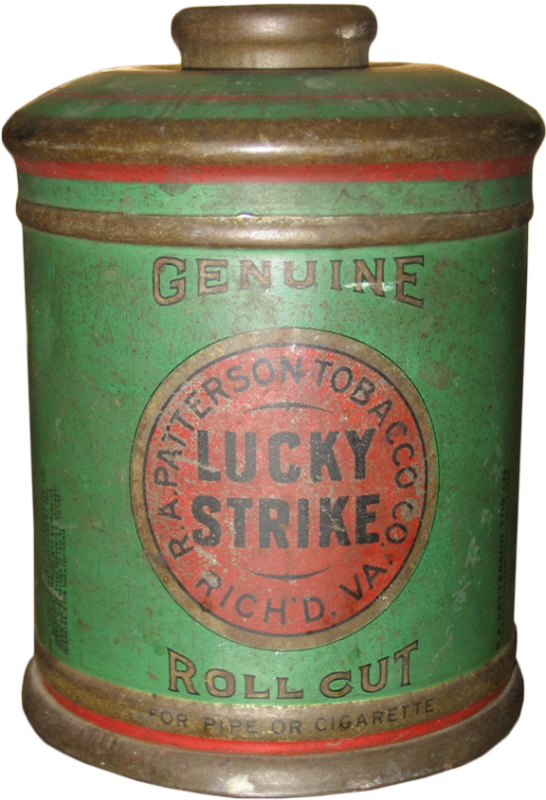 Lucky Strike Canister – This type of canister would usually sit on the counter in a store where it would serve as both an advertisement and dispenser for the product. This canister uses the R.A. Patterson logo. 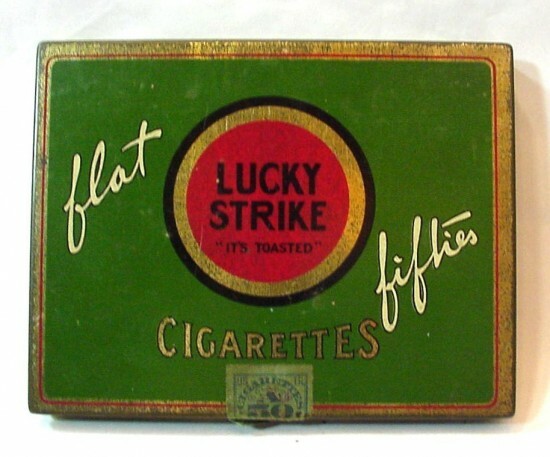 Lucky Strike Flat Cigarette Tin – This flat tin would hold 50 cigarettes and can also be found in a Christmas version. There is another flat 50 tin that has a slightly different design. The tins above tend to be fairly common and usually can be acquired on eBay, Etsy, or Ruby Lane from someone at any given time. They vary in price but tend to be from $5-30 with a couple exceptions in great condition being worth $50 or a little more. 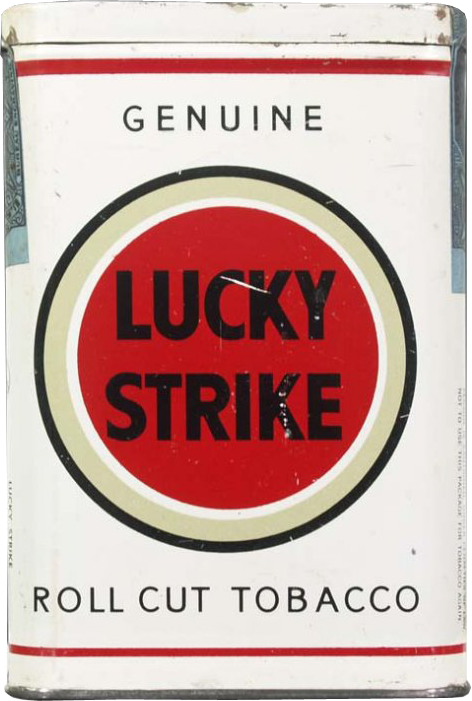 The rarest Lucky Strike Tobacco tin is the one below and it can be worth hundreds of dollars because it was produced only for a couple of months when the white packaging for Lucky Strike was first introduced and then tins were discontinued and cigarette packs became dominant. This is the rarest and most valuable of Lucky Strike Tobacco tins it was produced in the early 1940s just before cigarette packs replaced these tins and the unrolled tobacco for good. Note: My focus here is on the Lucky Strike tins in particular, but for those searching for information on cigarette packs you can look here, for more on ads used to promote Lucky Strike there is a great collection here. Today I’m going to start a small series of posts on tobacco manufacturers and where better to start than the biggest producer of them all, the American Tobacco Company. When James Duke started American Tobacco in 1890 by merging with several other producers, but Duke had been in the tobacco business since the 1870s where he had made a fortune by being one of the first people to mass produce cigarettes with a machine invented by James Bonsack. Bonsack had tried and failed to sell his invention to the William Blackwell Company (at the time the leader in tobacco sales which were focused on chewing and pipe tobacco as the cigarette was not popular at the time) and Duke stepped in and bought the rights to the machine, making him able to monopolize the cigarette market with much lower prices than any competitor. Duke, not content to sit on his laurels began using the profits from his cigarette monopoly to purchase other tobacco companies through tactics that would be illegal today such as price manipulation and undercutting to run his competitors into bankruptcy or insolvency so he could buy them out or force them to merge with him. When Duke incorporated the American Tobacco Company in 1890 he already owned at least 80% of the cigarette market and controlled most of the smoking or chewing tobacco producers through intimidation or business arrangements. By 1904 Duke had absorbed even the largest competitors: RJ Reynolds, W.T. Blackwell, and F.R. 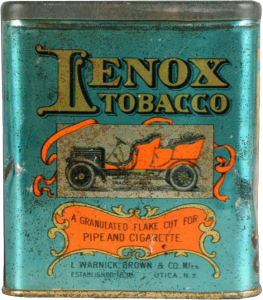 Penn, which meant that by 1906 American Tobacco owned over 80% of the US tobacco market. The power of the industrial monopoly had reshaped the economy of the US to the point that in 1890 Congress passed the Sherman Anti-Trust Act and in 1907 a court found American Tobacco in violation of the statute and ordered the company broken up, the company appealed all the way to the Supreme Court and finally lost in 1911. The company was subsequently broken into three pieces: American Tobacco, Liggett and Myers, and P. Lorillard. RJ Reynolds was also released from the company, and while not as large as American Tobacco had been, these companies still were each giants in the industry and still exist to this day. James Duke himself soon retired from the company and went on to pursue other interests including the founding of Duke University, which bears his name. 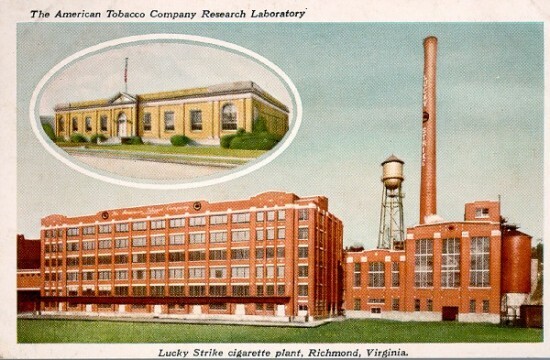 American Tobacco continued along after the breakup and had factories in Durham and Reidville, NC, Louisville, KY, and Richmond, VA. In 1916 American Tobacco introduced probably its most famous brand: Lucky Strike, but through the years the company introduced hundreds of brands to the market. The rarest Lucky Strike tin is this white one! The company would continue to operate under differing corporate arrangements until it was bought by Brown and Williamson in the 1990s. I still haven’t ever been able to find a complete list of brands produced by American Tobacco Co. so if you have a list please let me know because I would love to do a more in depth feature article on the company. I’ll be off for Thanksgiving until Monday but hopefully this post will give you a little eye candy to get you through. Thanksgiving and tobacco have always had a close relationship, the pilgrims and colonists learned of tobacco from the native americans and that heritage passed all the way down to the tins I have for you today. These tins that came to my attention recently and I was lucky enough to be able to buy them. They are Five Brothers Store Display Tins that came from the basement of an old country store in Oregon. It was also found with another Five Brothers Store Bin and a pipe display/sign for William Demuth & Co. Pipes. The colors on the yellow tin are very bright and clear, there is some fading and discoloration on the blue tin. These measure in at 10″ long x 9.5″ wide x 12.5″ tall and they really stand out. The detail in the horses’ heads and packaging is really spectacular and the size of these bins make for something you just can’t ignore ( looks like the ads are still working as intended even today! ). 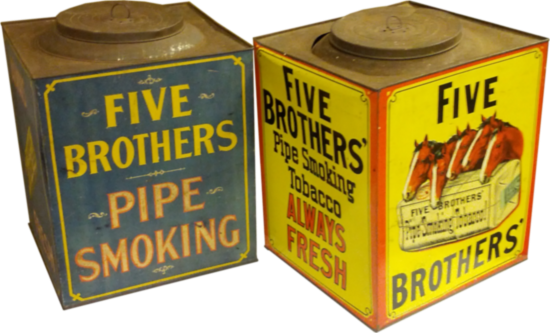 The Five Brothers Company was started in the 1860s by John Finzer (and his 4 other brothers, hence Five Brothers) and produced tobacco for pipes out of a factory in Louisville, Kentucky. By 1882 only two brothers were still with the company as 2 had died, and one had left the firm. 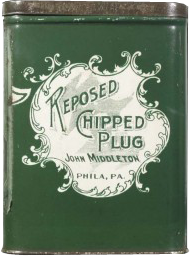 In 1882 the company was incorporated and operated into the early 1900s when it was bought by the American Tobacco Company who owned a virtual monopoly on tobacco until Roosevelt busted up the monopoly. Everyone be safe driving over the river and through the woods to Grandma’s house this week! Eat, drink, smoke and be merry! I’ll be doing a series of posts on some of the tins that came in the other day and hopefully if I do a feature on one per day I can last until I find more tins to do this with, anyway here goes! Description: Red background with illustrated panel of a Canadian Mountie on horseback. 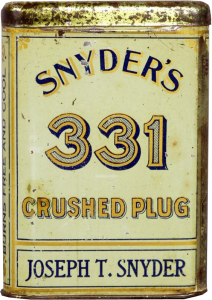 This tin is not in the best condition and has a lot of corrosion as well as some lost paint. It still has the original tax stamp for a 1/2 pound of tobacco dated “6-10-D Tobacco 1922”. 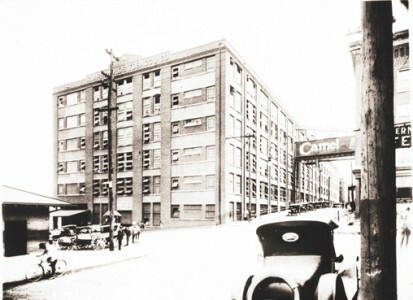 The Imperial Tobacco Company of Canada was founded in 1908 and is still in business today. 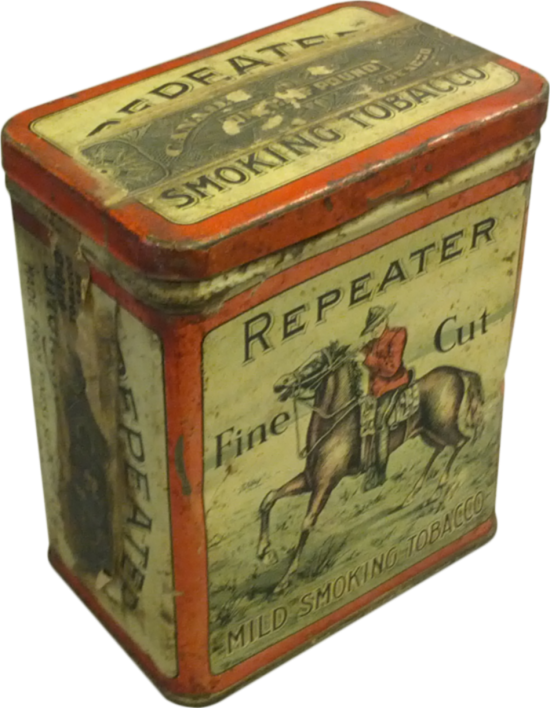 It is unknown how long the Repeater brand was sold, but these tins are not that difficult to find for a fair price. If you have more information about the Repeater Brand and would like to share please email to tell me about it! I feel like Christmas just came early, I received a package today from California full of tins I was contacted about by a woman who found the site. They’re not all super rare or valuable but it’s always fun to get new tins and this group has quite the variety! Below is a gallery of just a couple of the new tins. I always love these Tiger tins, this flat tin is nice, but this brand can also be found in larger canisters in the same orange color as well as in blue. 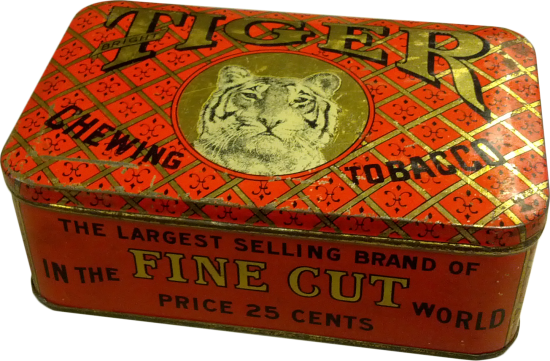 I’m a fan of Tigers both in tobacco tins and on the football field so these always catch my eye! This tin has great graphics with sphinxes and detailed borders. 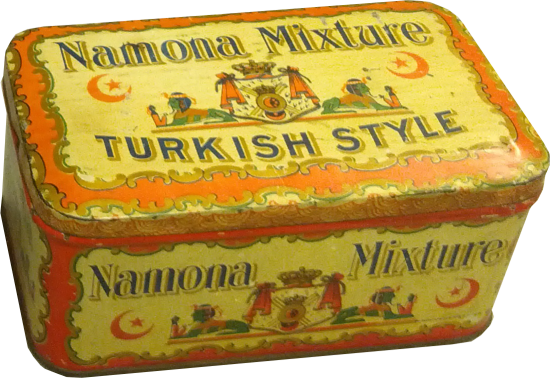 The Namona brand was produced by L. Miller & Sons out of New York. This tin is in pretty good shape and still has a bit of tax stamp on the right side. 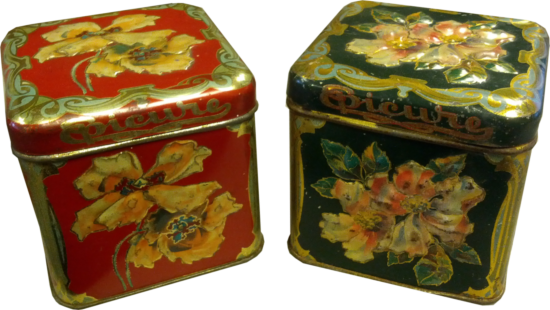 This pair of Epicure tins is just in time for Christmas! Each tin has great embosses flowers with rich color on a red or green background. I’m a huge fan of embossed tins as I think it adds a lot to the appearance. These look so much better in person than on the screen, but still a great get. This Cavalier tin has a rich teal background with gold and red decoration over it that really pops on display. 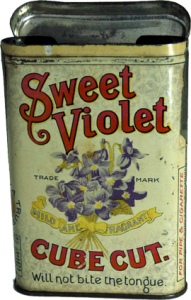 The tobacco was produced by Wilson & McCallay of Middleton, OH. It looks like someone used a clear coat or some similar surface treatment that has since yellowed the finish some. This tin is for Bohemian Mixture, which I believe was marketed to the West Coast specifically. Inside the lid it reads “Bohemian Mixture is put up expressly for fine pipe smokers of the Pacific Coast. It is made from the very best quality of the different kinds of tobacco stated on the outside of this package, and is guaranteed to smoke cool and not bite the tongue; if any imperfection is found, the purchaser is respectfully requested to report same to the undersigned, who will make ever effort to correct it. C. Michalitschke 101 Grant Ave. N.W. Cor. Geary St. San Francisco, Cal.” I’m an east coast guy so I haven’t seen this tin before but it looks great in person and the font on the top of the lid really looks good on display. 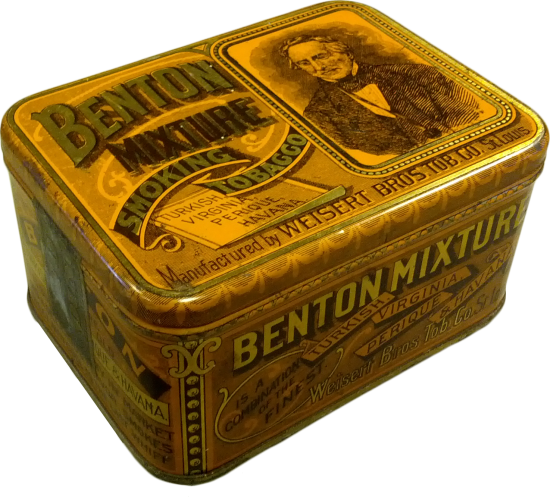 This tin for Benton Mixture by Weisert Bros. Tobacco Co. of St. Louis has a great black on yellow color scheme with gold outlines and lettering. I like this tin because every face of it has a lot of decoration and information. The sides also still have a 4 ounce tax stamp. There are a lot more tins that came in with these and I’ll probably keep going over them in subsequent posts. I hope you’ve enjoyed the update!